Take the “No I Challenge” to strengthen your writing in one week. Harder than a triathalon...the "No I Week Challenge." When it comes to communication, we humans are a selfish bunch. As writers, we strive to get our own point across…and yet, as readers, we always want to know: what’s in it for me? In a cover letter applying for a job: I am looking for an opportunity that will help me to grow. From a printer looking to sell his services: I would like a few minutes of your time to introduce you to my company. From an industry colleague asking for a favor: I need this by 2pm or I can’t make my deadline. As a reader, to all of those statements I say (affectionately)…who cares? Have you seen the length of my to-do list lately? Do you honestly expect me to grant your request just because YOU want it? A more compelling reason is needed to break through my clutter and raise your request higher up in my triage pile. 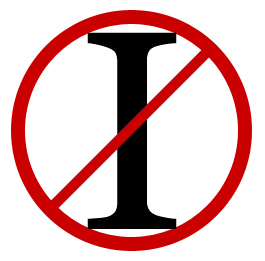 To be more effective in your persuasive writing, try this: stop using the word “I” as much as you can. Using that word pretty much forces the communication to have a selfish perspective. All sentences can be rewritten without it…they just need to be rephrased to adopt a different approach. A growth opportunity like this is highly appealing. With just a few minutes of time, you’ll learn how XYZ Company can save you money. This is needed by 2pm or the deadline won’t be met. Rephrasing sentences in this way takes the “you vs. me” conflict out of the equation, and infuses some third-party credibility into the content. It’s also far less emotional, and certainly more objective. And all that combines to make the content more effective. This strategy alone won’t make your audience drop everything and do your bidding, but it definitely starts to stack the decks in your favor. I am hoping you will help me as soon as possible. OR… We are hoping you can help us as soon as possible. OR… These answers are needed as soon as possible. We recently had a “No I Week” challenge here in the office at Redpoint, and even we – who write for a living! – had a hard time achieving the goal. You will get frustrated, you will feel like you’re sounding ridiculous, and there will be times when you stare at your computer screen forever just trying to reword something mundane like “I have a doctor’s appointment at 10 am tomorrow, so will be in a bit late.” Stick with it. By the end of the week, this extreme heightened awareness of the “I” perspective will temper your writing moving forward. You will certainly have cause to use the word “I” in your writing, but you’ll be far more judicious in how you employ it. Of this, you are assured by me. For more quick writing tips shared within redpointspeaks.com, click here. It will be thought-provoking to give this a try. Thanks for the challenge. Diane…when you’re ready to throw your keyboard out the window, please don’t be mad at me. 🙂 It’s not an easy task, but it really does help!